This is a guest post by Austin Lee. Austin is a freelance copywriter who helps 6 and 7-figure businesses grow sales with engaging email autoresponders. At the age of twelve, Curtis Jackson III — also known as 50 Cent “— started dealing drugs on the cold streets of Queens, NY. He discovered how fickle their tastes were early in the game, barely beating the clock to sell off a batch of drugs, and pay back a certain “connect” who fronted him the product. Not wanting to ride that razors edge again, it was time to seek veteran advice. There was a hustler named Dre who’d been in the game for years, which was rare; considering most were either dead or behind bars. Dre passed along a profitable piece of street wisdom to ‘Fiddy’ and marketers alike. In fact, you can improve loyalty, engagement, AND sales in your copy…all while upgrading the customer experience. Two Types Of Hustlers: Which One Are You? Problem was, this distanced perspective meant Fifty was losing touch with his life source. He felt like he was shooting blindfolded in the dark, so Fifty asked Dre how to develop rapport with the unpredictable fiends. Dre answered by explaining the two classes of hustler. One fails, one succeeds…and the two categories struck me, because of how perfectly they map onto marketers selling stuff to their audience. Outside Hustlers: for this group, it’s all quantitative. They do business from a safe distance, only interacting when the situation demands it. Separated by a self-made barrier, they never get to know the customers and their unique needs beyond a superficial level. Their tunnel vision is guided by pure analytics, which clouds the deeper (and far more important) motivations of buyers. Inside Hustlers: this hustler operates with insatiable curiosity into the ticks and nuances of the customer. She levels with them on their playing field, getting an inside look into their real desires and needs. She doesn’t fear the fiends; she’s fascinated by them. This open mind creates room and empathy to transport inside the mind of the fiend. Most marketing belongs to the first class. It’s “purely mechanical and dead” as Mr. Dre explains it. It’s sprinkled with off target, cookie-cutter assumptions about who you are and what you want. Luckily for you, our boy Dre has a simple system for ensuring you avoid all above-mentioned transgressions. The hustler: presents a drug fiend with a free offer of product. The goal is to determine if it’s good or bad immediately. No waiting and wondering. The marketer: starts getting feedback early in a campaign. What I love about this rule is, it applies to anyone, selling anything. To any market. Fifty applied it to his music — putting out samples on his website, and adjusting them based on what his fans were saying. This allowed him to produce guaranteed hits while other artists guessed and prayed. Another example: Silicon Valley startups often go to market with a minimum viable product. In other words, they aren’t “clicked all the way in” to their skis before they start flying down the mountain. The goal is to iterate deliberately, based on feedback. I’m no expert in Ryan Levesque’s ASK Method, but maybe you’ve heard of his famous “Do you hate me?” email. If not, give it a quick Google search. It works. The core idea is to tease out valuable info not by pressuring them, but by playfully asking for their valued opinion. Remember, we looooove when people ask our opinion. Then, tweak your product (or create a new one) to meet the specific needs of your people. Google forms is a great free resource I used with a client who teaches online tennis. I was surprised to find a much higher percentage of his list were middle aged coaches interested in learning modern ways to teach their students. It was a key finding we used to adjust the copy, and speak more directly to that buyer group. To answer a question you might have on your mind: no… I don’t think your customers are “fiends”. The point I’m making is: people want to feel understood. Further, they want your marketing and products to align with that tailored understanding of what’s going on in their life. Like Fifty chatting up a junkie in a hot Queens parking lot, you must go out of your way to gain that understanding. Dre taught Fifty, that once you have a relationship with key fiends, you foster them constantly. “[the fiends] supply you with valuable information about any kind of changes in tastes that are happening. How do you adapt this to your business? One of my client’s Facebook group is a hotbed of activity. A simple, well thought out question can ignite a discussion within minutes if he strikes the right nerve. Another way to put out your “feelers”, is to post questions in Quora, Reddit, or popular forums. Simply hanging out in these places gives you an edge over copycat marketers and competitors who guess what their people want. And, you don’t have to be a great copywriter if you deliver the right product to the right customer. For Fifty, simple listening revealed that drug users weren’t as off-the-rails as he had thought. After shortening his distance and creating rapport, he found they liked convenience, novelty and any kind of deal. What’s interesting, is you can use these same three “deal triggers” to create your own winning sales messages. Novelty: We are naturally drawn to what’s new. If for some reason your offer is feeling stale, you can create novelty by packaging multiple things together, offering a bonus, or running a contest to spice things up. Deals: discounters like Costco and Nordstrom Rack have deepened a buyer mindset in masses of people who now laugh at full retail prices. It’s important to recognize the mental bias. An alternative to discounting is extracting all your benefits and features, listing them out, and comparing your offer against higher-priced alternatives to “stack the value”. Framed this way, it’s hard for your offer NOT to look like a juicy deal. Use this nifty checklist to be a closer on your checkout page, and quit losing ready-to-buy customers. Ease buyer’s remorse with a human follow-up email, explaining the next steps for getting the most out of the product. Just because the sale is over, doesn’t mean your job is. I’ll leave you with this checklist, and trust you will keep your finger on the pulse of your market —using Dre’s tenured street wisdom to go forth and profit. Go be an inside hustler, even if you’re a white boy like me. P.S. If you’re like me, heard “Candy Shop”, and thought 50 Cent was a total clown — you might like reading The 50th Law by Robert Greene. Totally changed my mind. And, it has stacks of other priceless marketing lessons. Austin Lee is a direct response copywriter who helps 6 and 7-figure businesses grow sales with engaging email autoresponders. 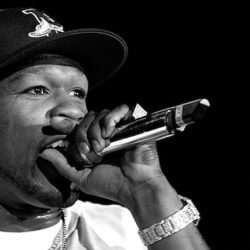 Inspired by 50 Cent’s uncanny ability to give the RIGHT message to the RIGHT market, Austin wrote a simple 5-step checklist to dial your message-to-market match. If you want to laser-focus your sales message in < 10 minutes (even if you aren’t a “copywriter”) you can get it right here.